We loved the movie, but would the soundtrack be just a fun for my kids? You bet! When the soundtrack arrived at our house, the kids couldn't wait to listen to it! With songs like "You Spin Me Round (Like a Record)" and "Put Your Records On" -- all sung by the Chipmunks and the Chippettes, I knew that my kids probably already knew many of the words. We were in the kitchen when we started the CD, and right away, they all started dancing around! Even my 11-year-old (who is a bit too "cool" to dance with a couple of preschoolers) moved and sang to the music. It was super fun for them, and a great way to get the wiggles out on an afternoon when it was too windy to go out and play. Their favorite songs were "Single Ladies (Put a Ring on It)" and "So What" -- which they were already familiar with from TV, radio, and the Kidz Bop CD's we had listened to in our home. 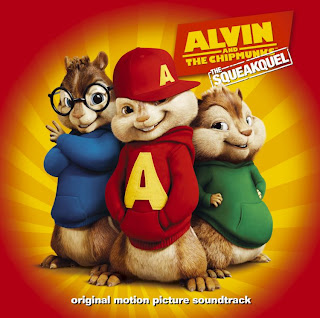 Surprisingly, the kids claimed that they liked listening to the Chipmunks singing more than the kids on the Kidz Bop album. My son's only complaint to the whole album was that a few humans did special appearances on the album. "Why can't they just let the Chipmunks do all the singing?" You can purchase the soundtrack from popular retailers like Amazon and the Apple iTunes Store!